My little one Tyler who is only two loves penguins, the penguin from Edinburgh Zoo has been his favourite since he was a baby. 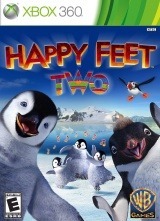 When I was asked to review Happy Feet Two for the Xbox 360, I could not say no. And with being an Xbox Ambassador how could I not. We just recently watched the first film which made the game even more enjoyable. Warner Brothers have produced the graphically pleasing and fun Happy Feet two. Happy Feet Two is a fun game which all the family can enjoy. The musical will have you tapping and dancing along to the beats and the very cute penguins will have you oohing and ahhing at their cuteness. It really is a lot of fun and I the graphics are just stunning. The mission of the game is that their are new dangers that are threatening the Penguin Nation and everyone has to work and dance together to save the penguins from their extinction. Players can use dance moves to collect other penguins to join them, stun their enemies with their moves and manipulate their environment to help solve their puzzles. Level one allows you to practice the moves and try out your skills, practice the moves you need and collect notes. The kiddies will be laughing along as you or they play. My little ones favourite was when you got all the penguins to clap. My oldest loved it when the penguin slid down the slide on his belly and smashed up the rocks. Along the way you get to unlock new songs to get your hips swaying and feet taping to. I would say my two aged 2 and 4 were a little young to play this game on their own. The game itself is suitable for them to watch and cheer along as you play, but some of the moves were a little tricky for them to master. The oldest could do most of them and with some help and guidance I think could do a far amount. I’m sure with some practice he could get there. Unfortunately we were unable to test out the 3D part of this game as we don’t have a 3D tv, however I’m sure it’s on hubby’s wish list. We really enjoyed this game. It’s great fun, looks amazing and the music will get you out of your seat and copying the penguin moves. Although the little ones loved to watch and try to play along I would say it was best aimed at slightly older children maybe 6 onwards. However I’m sure with some practice my oldest will get the hang of it. I definitely enjoyed playing it and one I will keep going back to, plus the penguins are just so cute. The only thing I wish this game had was that it was Kinnect compatible, which it isn’t. Now that would have been fun controlling the penguins through dance. Maybe next time. At £34.99 for the Xbox 360 I think this is good value for money. Disclaimer:- I was sent a copy of Happy Feet 2 in exchange for an honest review.